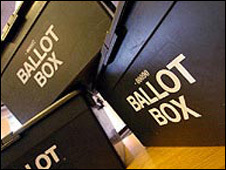 Cumbria County Council has ended up hung in the last two local elections, and although it is likely to remain that way some of the contests are worth a closer look. The Conservatives could do with winning some of the county's parliamentary seats at a General Election so will be looking to make progress in key areas. Carlisle is their top target. They already have nine county councillors in the city, but they will want to remove some of the seven Labour representatives to show they pose a real threat - especially as the city's Labour MP Eric Martlew, is due to stand down at the next General Election. They will also be looking closely at results in Barrow. The town's MP, defence secretary John Hutton, may be high profile but his seat is looking increasingly vulnerable. The Tories have made real progress in the town, becoming the largest party on the local borough council, and will want some Labour scalps. The same will also be true in the Copeland area, which also has a potentially vulnerable Labour MP. And then there is the South Lakes, where Lib Dem MP Tim Farron caused a shock by unseating the Tories at the last General Election. The parliamentary seat - Westmorland and Lonsdale - is very marginal, but the Conservatives have gone backwards there in recent years and will want to arrest that decline. However, given that these elections are local, the economy, school places and the state of the roads may well be an influence. There will have to be deals done afterwards too. At the moment Labour are running a minority administration, but for most of the last eight years there has been a Lib Dem-Tory coalition. Unless the Conservatives have an exceptional year, some horse-trading will have to be done. But whoever runs the council, local taxpayers will be looking for further improvements. Although the last year has seen significant progress it's still only assessed as scoring two stars out of a possible four by auditors.